Founded in 1995 with headquarters in Moscow, Russia, Renaissance Capital is a leading investment bank focused on Russia, the Commonwealth of Independent States (CIS), Central and Eastern Europe and Africa, and other high-opportunity emerging markets. The firm offers its clients access to developing markets throughout the financial centers of London and New York, with locations in London, Johannesburg, New York, Nicosia, Nairobi, Lagos, Dubai, and Istanbul. In November 2012, Onexim Group, one of Russia’s largest private investment funds, announced an acquisition with a 100% stake in Renaissance Capital. As of April 2013 the transaction was finalized, allowing Renaissance Capital to continue growing its business by maintaining its focus on other emerging regions. Renaissance Capital sought to increase efficiency by bringing its eight offices around the world to a single system of record. The company had been using different HR systems across its locations, including Microsoft Axapta in Russia and the CIS. In Workday, Renaissance Capital found a solution that could provide the unified, global reporting it desired, while still being able to comply with local regulations. 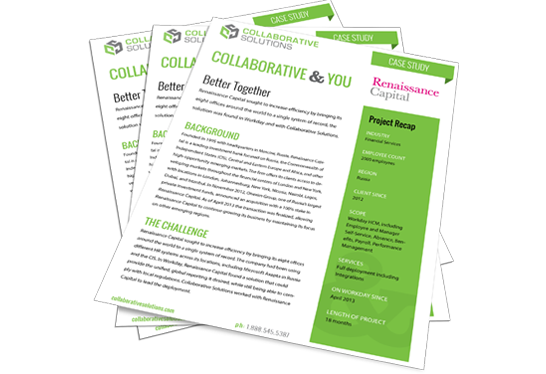 Collaborative Solutions worked with Renaissance Capital to lead the deployment. Renaissance Capital achieved greater operational effectiveness by leveraging Workday’s business processes to standardize practices across the company. Collaborative Solutions deployed core HCM, Absence Management, Performance Management, and Payroll Integrations across the company as well as Benefits for its Russia locations. This multi-center based project had resources spread across Washington, D.C., London, Johannesburg and Moscow. This project marks Collaborative Solutions’ first Russian-based engagement. The move to Workday’s integrated HR system was a successful one, allowing the company to consolidate its organizational structures and capture data electronically at the source, rather than on paper. With its rolling enhancements increasing functionality, Workday provides Renaissance Capital with a platform for unlimited future growth. Renaissance Capital sought to increase efficiency by bringing its eight offices around the world to a single system of record.